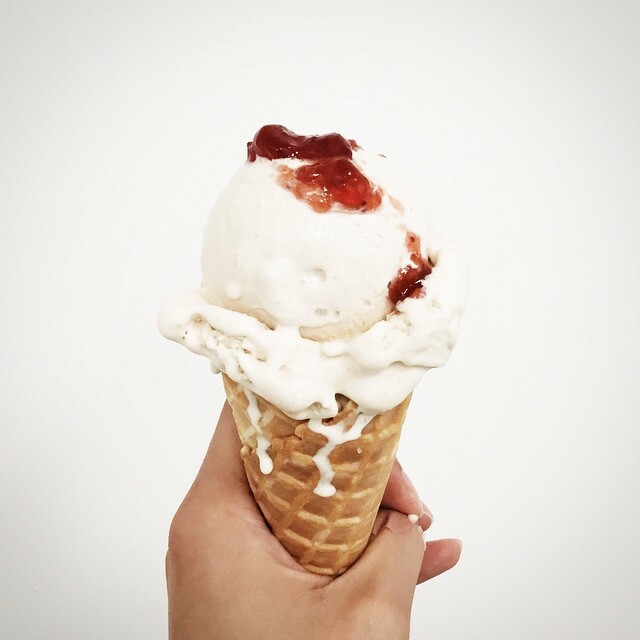 THE ONLY CONE YOU SHOULD EAT ICE CREAM FROM IS THE PUFFLE @ CAULDRON ICE CREAM - SANTA ANA - EAT WITH HOP! *Note: All of the following photos are taken from the official @CauldronIceCream Instagram account and do not belong to me. IF YOU DON'T PLAN TO EAT IT IMMEDIATELY, GRAB IT TO GO! 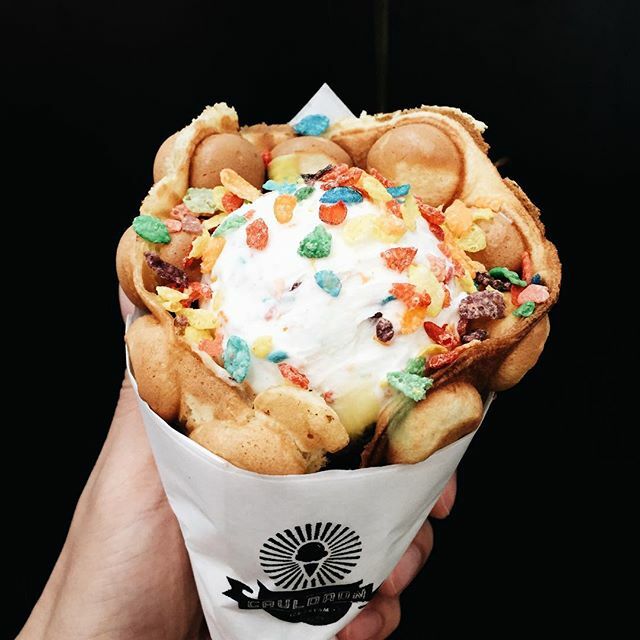 THE EGG WAFFLE AND ICE CREAM WILL BE PACKAGED SEPARATELY SO IT WILL MELT IN YOUR MOUTH... AND NOT GET STICKY ON YOUR HANDS! 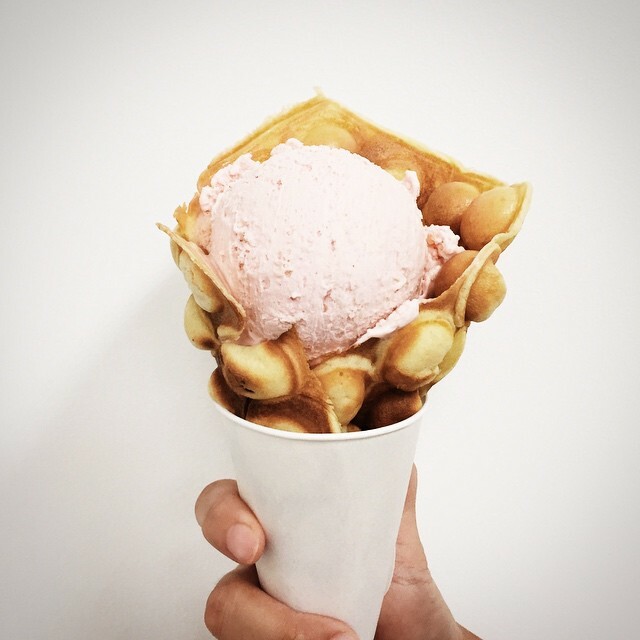 ACCORDING TO THEIR INSTAGRAM, THEY ALSO STARTED SELLING THE FOIE GRAS FLAVORED ICE CREAM ABOUT 2 MONTHS AGO. THAT SOUNDS CRAZY? BUT CRAZY ENOUGH I STILL WANNA TRY IT! THE PUFFLE, AN OG CREATION BY CAULDRON ICE CREAM DEBUTED JUST ABOUT A MONTH AGO AND THE HYPE THAT FOLLOWED EVER SINCE IS VERY MUCH WELL-DESERVED. OR SO I'VE HEARD. About a month ago I was religiously scrolling through my Instagram newsfeed like always and lo and behold something exciting caught my eyes that made me double tap. IT WAS SOMETHING CALLED THE PUFFLE. It was a photo of an egg waffle folded into a cone shape with a scoop of ice cream in the middle. WHAT AN INGENIOUS INVENTION. Why didn't I ever think of this before? And most importantly, why am I not in SoCal right now to try this?! For those who don't know, I'm currently in Japan right now stalking matcha everything and Pikachu but I honestly miss the crazy and innovative desserts back home in Orange County. 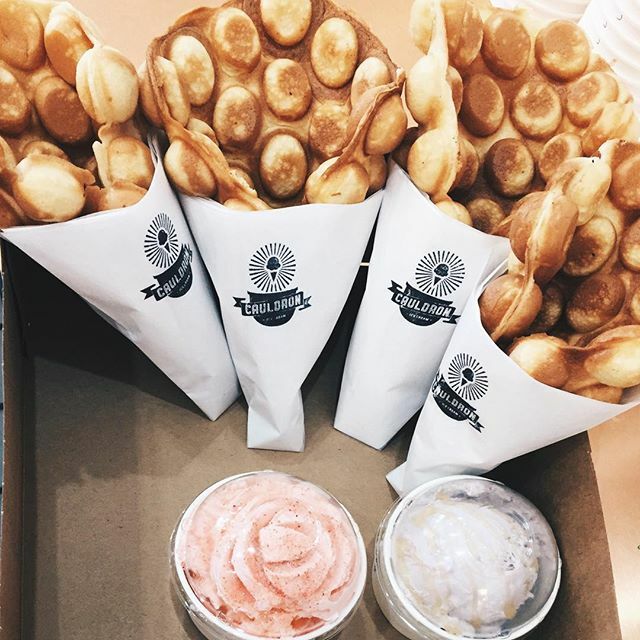 The Egg Waffle originates in Hong Kong and is a very popular street food. The first time I ever tried an egg waffle was at the OC Night Market (Thank you Orange County for Food Diversity!). It's basically a waffle... but .. with bubbles. Basically those bubbles look egg-shaped and therefore it's called an egg waffle. When fresh, it's crunchy, it's hot, and it's perfect finger food. Inside the bubble or "egg" is air so you're basically biting into a floury bubble. There are variations that come with filling inside such as chocolate or cheese. I actually tried the egg waffle again in Singapore and wasn't disappointed. Liquid Nitrogen Ice Cream has become a booming trend ever since Creamistry opened up in Orange County. (There was the Ice Cream Lab that was already in Los Angeles with the same concept). 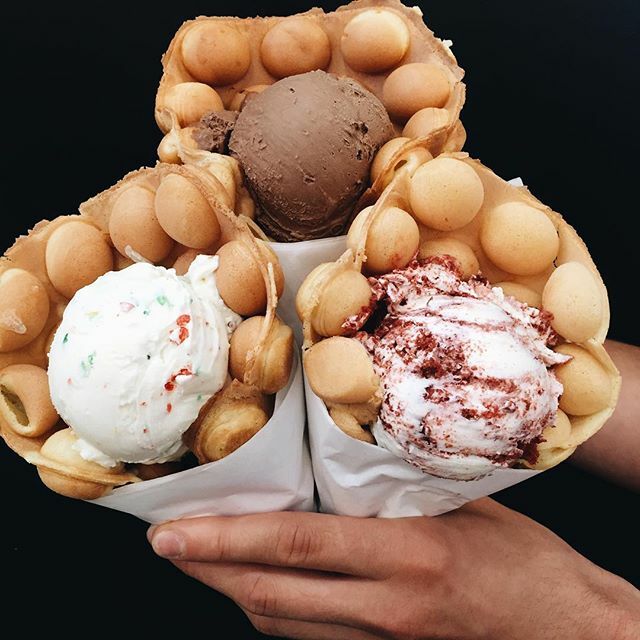 Many others have opened specializing in Liquid Nitrogen Ice Cream such as Chocolate Chair in Buena Park, A La Minute in Orange and Scoops n Scoops in Irvine. Cauldron Ice Cream recently opened in Santa Ana a few months ago also specializing in Liquid Nitrogen Ice Cream and for those who still don't know what that is, it's basically a science show in front of your eyes. It's freshly made ice cream that you can see being made with liquid nitrogen! What makes Cauldron Ice Cream different from many other liquid nitrogen ice cream shops is that they stay innovative with their menu. Their selection is unique and of course worth a try. The introduction of THE OG PUFFLE is a serious game-changer that definitely seems to be worth all the hype. Although I haven't tried THE PUFFLE yet I've already made plans with my bf to take me there first thing when I return to Orange County! P.S. I've tried their ice cream before and I recommend the Rose flavored ice cream. They put these crunchy sugar sprinkles (?!) that give it a nice texture!